How and where do I submit my COL account application forms? You may also send the originally signed forms to COL Financial Business Center or Investor Centers. Once we receive your requirements, a sales officer will review your application and contact you to inform you of the status of your application or any other requirements that may be needed. 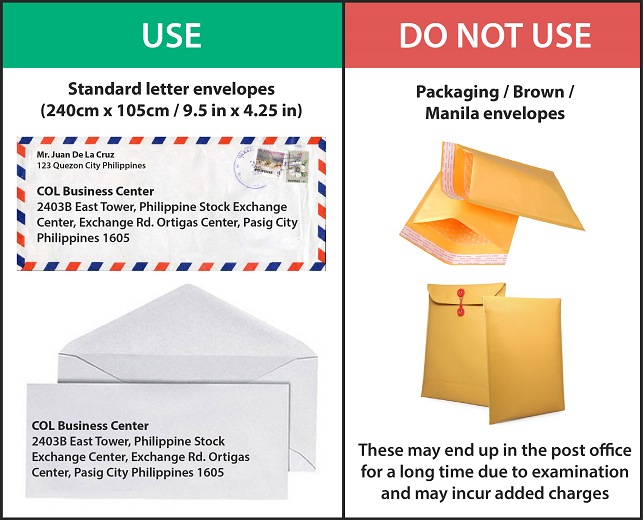 We also recommend that you send us your forms through mail courier services in the size and package below. Note: Some iRemit branches are unable to accept COL Financial forms and can only do your funding. These are Japan and some in the Middle East.